Anything to do with the things that make the music we listen to. From time to time people ask how music affects our minds . . . but I ask rhetorically "What is music?" It's a collection of vibrations which are either together, as multiples and as one sound, or not together, so giving contrasts of certainty against uncertainty, solid vs liquid, secure vs insecure - and in that we start to see contrasts which move towards a psychological level. But much of this is lost in modern tuning of music but known to and exploited by classical composers. "Chromatic", as in the "Chromatic scale", is a word the meaning of which is lost on the Wikipedia page and https://www.youtube.com/watch?v=qqS_IjKo-d8 explains. 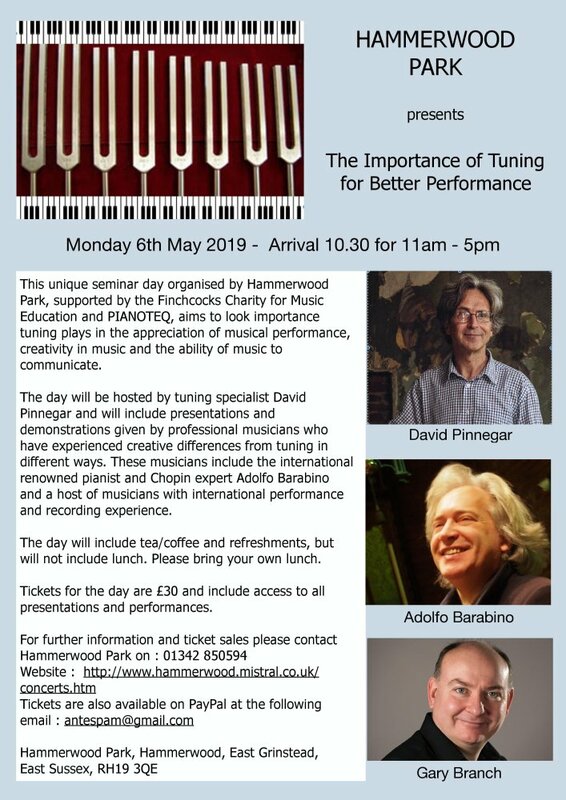 More than this, historic concepts of tuning can improve the sound of the instrument, so the seminar on 6th May will be bringing top musicians together, music lovers and piano tuners and technicians. People are tiring of the black shiny instrument with a shimmering sound which doesn't convey emotion and which can be played mechanically and percussively as mere entertainment, and as a result interest in classical music is in sad decline, particularly in education. Revisiting the foundations of the sound that makes music can open new perspectives and we look forward potentially to sharing them. Interesting. All I can add to that is as someone who plays blues guitar what has always interested me is the importance of the hundreds of notes that live between the flat third and the fourth.
. . . the importance of the hundreds of notes that live between the flat third and the fourth. Interesting thread though, as you say. Crikey Ed, gpwm.. where do you get them from ! ( I had to look it up ) . This is very interesting - thanks for the vid. A very good school friend of mine ( now in Germany ) took a music degree at Oxford, and specialised in harmony as one of his options. He attempted to explain a few things along these lines many years ago. That's a really interesting video. I'm not sure that the guitar is very different although there may be something either in tuning the strings in perfect fourths or to the frets, but most importantly in the singing which seems in close harmony almost as Barber Shop with a very pure sound in places. It's so very alive. Don't know for certain. I think its a combination of several things. First I think possibly a cheap guitar with high action meaning that the note can be hit hard. Second that African rhythm thing that seems to revolve around 12 notes instead of the western 8 note pattern. And finally there is a looseness to the rhythm, that I have spent years trying to get inside as it exists in a lot of blues. Annoyingly I just about started to get it when my hands started going downhill so playing stopped being fun. it put me in mind of Richard Lloyd of Television fame. I always thought his guitar work was slightly 'out'. whenever I pointed it out to somebody they couldn't hear what I was getting at, so it maybe my ears. it certainly forces attention to western ears but I suspect the emotional connection might be down to cultural upbringing. I've just remembered some of the teenage conversations revolving around liking or disliking Ravi Shankar. Everybody was agreed that his ability was awesome but there was polarised opinion as to whether it was 'liked'. Is this the same thing..cos to my ears the sitar has that same twangability and sounds 'out of tune' to 'standard' western ears. I think that perhaps a citar player might be coming on 6th May. It should bring a lot of interesting people together. I found this quite challenging at the beginning but sticking with it was rewarding.. It's not off topic at all. The assumption that is made is that all notes should be equally spaced. Then they are not in harmonious relationships in musical chords. What has really happened is that the equal spaced system has been convenient to tuning pianos to make them sound evenly glossy. A modern hi-end brand piano is a glossy glistening sound perfectly adjusted and regulated to make us worship the gloss but it's more difficult to get behind that to reach the music. In particular the major third, as tuned equally, beats quite strongly against the 5th harmonic, two octaves and a third above the fundamental pitch, and this beating gives the impressive shimmer to the sound. Pianos before the 1860s suppressed the 5th harmonic and emphasised the 3rd harmonic, the quint, octave and a fifth. This lent itself to tunings based on many perfect 5ths and resulted in very harmonious 3rds in the home keys giving great sweetness to the sound and giving special effects to the "remote" keys. It was for this reason that Mozart, Haydn, Beethoven, Schubert and Chopin were very particular about the keys in which they composed. When we revert to systems of tuning involving lots of perfect fifths we both restore the key characteristics as well as improving piano sound, enabling it to be smoother, less vibrating, less vibrationally noisy, more calming, more interesting and more exciting when we change key. So it's good for Jazz as well as Classical.